This is something I first made years ago as a fresher at university, and it’s developed into a firm family favourite. Mum’s an avid gardener, and every year we end up with a huge glut of fruit and vegetables: this is the perfect way to make sure nothing goes to waste. Whether or not you grow your own veg, though, at this time of year it’s all so fresh and gorgeous, and this meal is wonderfully quick to make whilst still feeling like something special. 1. 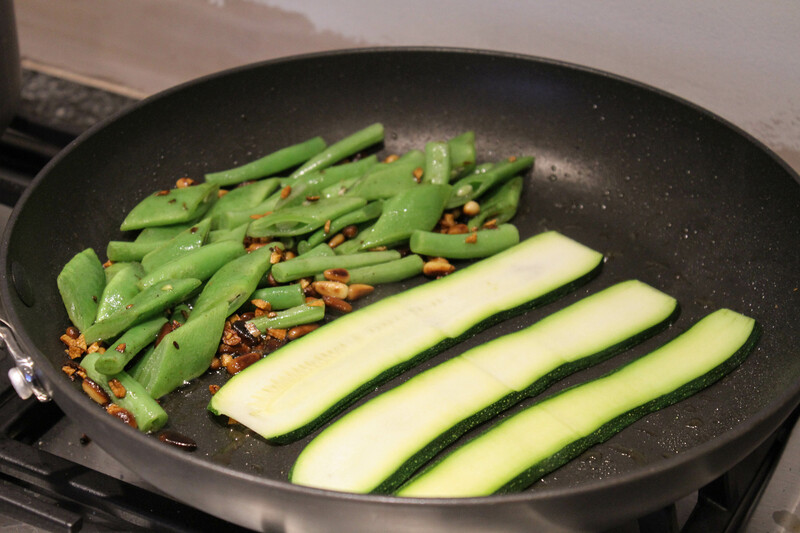 Begin by prepping the veg: top and tail the beans, and slice into pieces (about 5cm long). 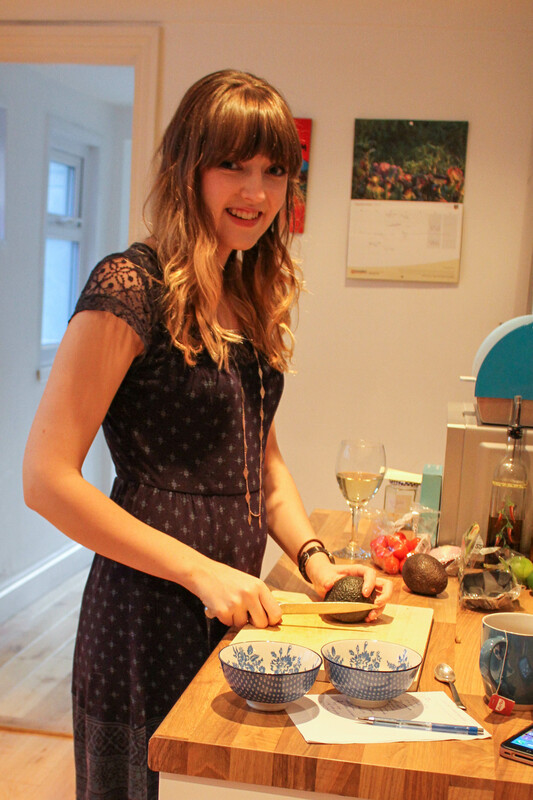 Top and tail the courgette, and use a vegetable peeler or cheese slice to peel it into ribbons. 2. In a large frying pan, toast the pine nuts for a few minutes on a medium heat until golden brown. 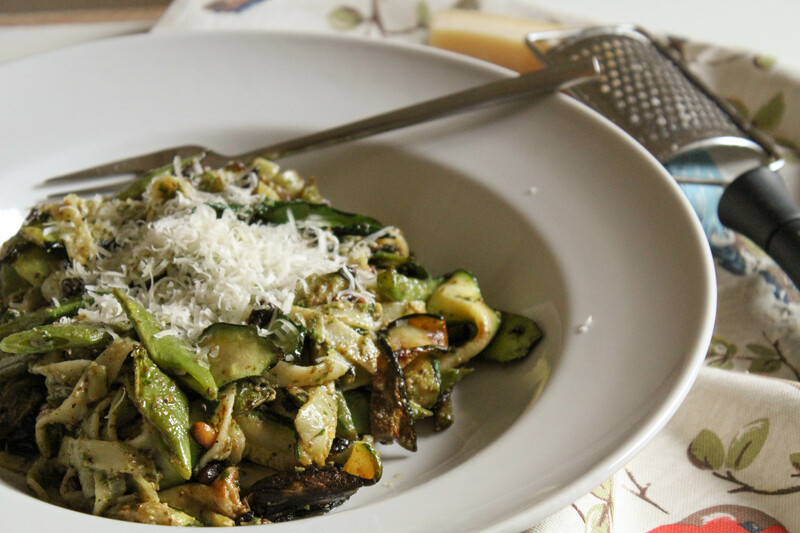 Drizzle in a splash of olive oil and add the garlic and the green veg (not the courgette); cook for about 5 minutes, then push everything to the side of the pan and carefully lay down as many courgette ribbons as will fit. This is generally a good time to put the pasta on, too. 3. The courgette ribbons generally take a couple of minutes to cook – when they’re soft and golden, stir them into the rest of the veg and repeat the process. 4. 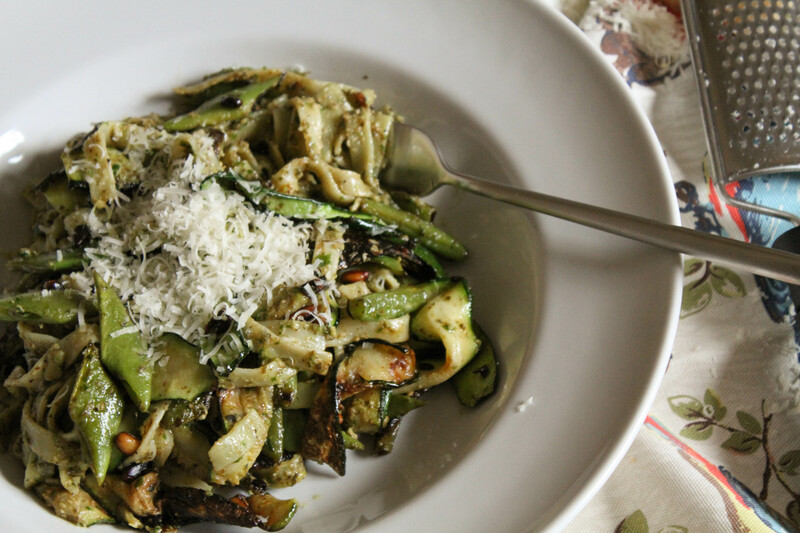 When all the courgette is cooked and the pasta is ready, stir the contents of the frying pan into the pasta along with the pesto. To serve, transfer into bowls and grate over some veggie parmesan. Ps. After many years of hoping, dreaming and saving up, last week I finally bit the bullet and bought myself a DSLR! I’m still learning how to use it properly, but it’s my baby, and I can’t wait to take lots of gorgeous photos with it to make you all drool.